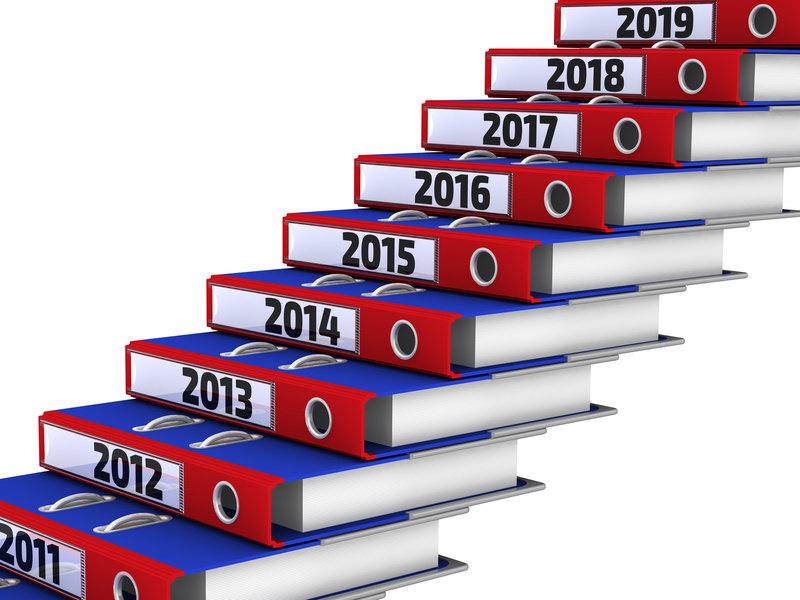 What’s the first action when donors receive annual reports? What is the first thing donors do when they receive your nonprofit organisations’ annual report? What is the first action donors take when they look over a donor wall or a recognition list in a program book? They look for their own name! What is the next thing they do? See if their name is spelled correctly and printed the way they wish to be addressed. Thereafter, what does the donor do? The donor ensures his/her name appears in the correct giving category. And, what is the final act of this donor? He/she looks to see who gave more or an equivalent amount of money. I received the Impact of Giving report from The Australian National University (ANU) this week. It’s a beautiful donor care or stewardship publication. I realised the first thing we do is flip to the donor listings and we are conditioned to look ourselves up in a similar fashion to the way people used to in church bulletins in years past. We are only human. We all do the above things and we have been conditioned to do these things by charities issuing annual reports, recognition lists, and donor walls. Listing one spouse, but not the other. Listing a spouse against the donor’s wishes. Listing a spouse after a divorce occurs. Listing a former spouse years after the divorce. 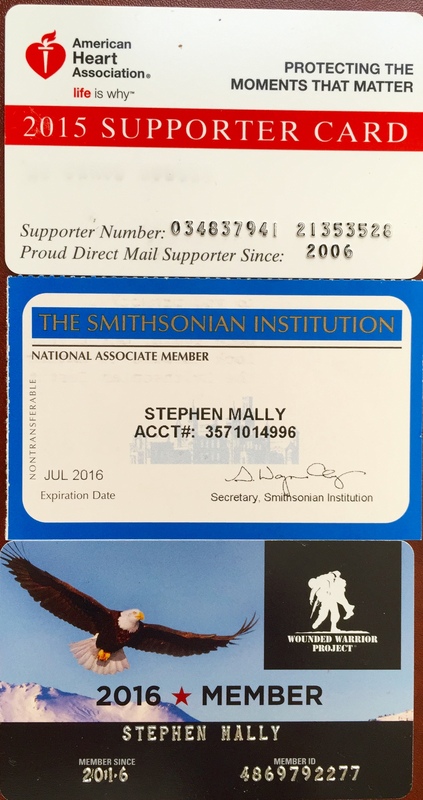 Using the incorrect format for someone’s name – Mr Stephen Mally rather than a preferred name, Mr Steve Mally. Listing a gift, which was meant to be anonymous. Listing an incorrect amount or excluding certain gift types, which results in the “incorrect amount” in the donor’s mind. Placing a name in the in memory of listing when, in fact, the person is alive. Did any of the above bring back any bad memories for you or send you into a rash? Establishing a proper donor recognition program within your customer relationship management (CRM) system is critical for ease in producing the donor recognition listing. My name was in the ANU report, was correctly listed and…it was the first thing I checked in the report! Gifts in memory – what follow up is appropriate? People often times create a tribute at a charitable organisation when their loved one passes away. They will often times request people to give a donation to designated charities in lieu of flowers. Gifts in memory are a beautiful way to memorialise someone and to also support nonprofit organisations important to the survivors or to the loved one who has died. The charitable organisations work hard to acknowledge the gifts made in memory of the person as quickly as possible. Nonprofit organisations focus on the processing of these gifts and sending notifications to the designated family member. But, what sort of follow up is done once the gifts start to trickle off? Perhaps charities might do a better job maintaining contact with the survivors a few months after the tribute period and, likewise, make contact on the anniversary of their love one’s death. Not only is this a humane and meaningful thing to do for the family who will continue to grieve for the rest of their lives, but it is also a prudent act as part of your stewardship activity. It shows the family you truly care and, at the same time, may cause them to remember your charity on the anniversary of the death and/or the next time a sad or happy occasion requires a tribute. It is a safe bet to assume a hand written note or a phone call a few months after the death and, again, on the anniversary of the death will be most welcome. Thank you’s and expressions of sympathy via Email? NO! Are Email thank you notes and Email expressions of sympathy acceptable? I recently read a brief article address this topic in Time magazine and I was horrified. I suggest it is never acceptable to send expressions of sympathy via Email and, rarely, is it acceptable to express a formal thank you via Email alone. Nonprofit organisations should consider times when Emails are sent to donors and volunteers when, in fact, a hand written note would have been more appropriate. What is wrong with us, as a society, to suggest we cannot pull a thank you card from our desk drawer and take 5 minutes to wrote a personal note? 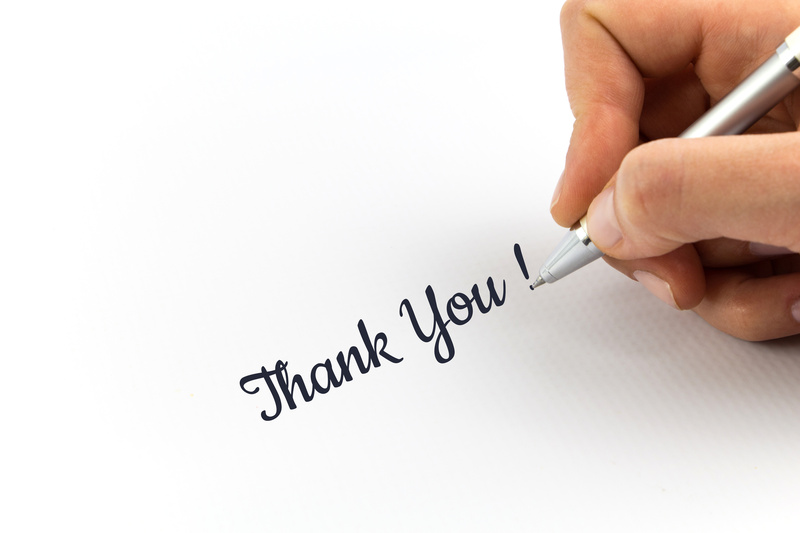 I get it – Email is fast, efficient and you are not going to hand write a thank you note to everyone for every occasion. I am talking about special occasions here. Whoever you are thanking did something extraordinary and they deserve to learn of your appreciation. There is nothing personal about an Email. A quick thank you via Email may be acceptable, under certain circumstances, but to not follow up with a personal not is not acceptable. The same could be said with expressions of sympathy. Why can’t we run to the store to purchase a sympathy card appropriate for the person and take 5 minutes to write a very personal note about the loss? I would argue most people shut down their Email during periods of grief. So, to rely on the party receiving your Email is a gross assumption. 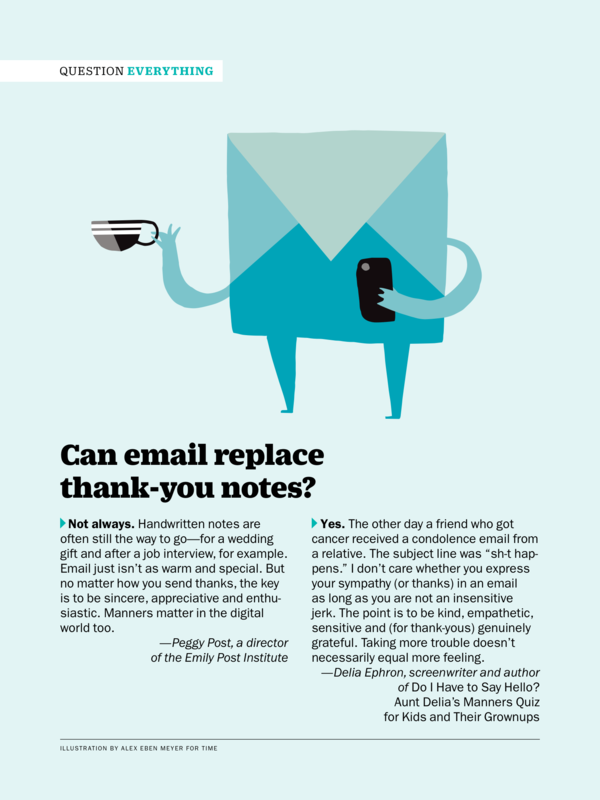 Additionally, the impersonal nature of Email may leave an impression about you. I cringe when I see expressions of sympathy on Facebook, LinkedIn and other social media. It always appears to be less sincere, very public, and extremely impersonal. There are always exceptions and solid reasons to use Email. Email serves a purpose in terms of delivery of quick messages. In the case of thanking and expressing sorrow, when in doubt, take a few minutes and error on the side of personalisation. 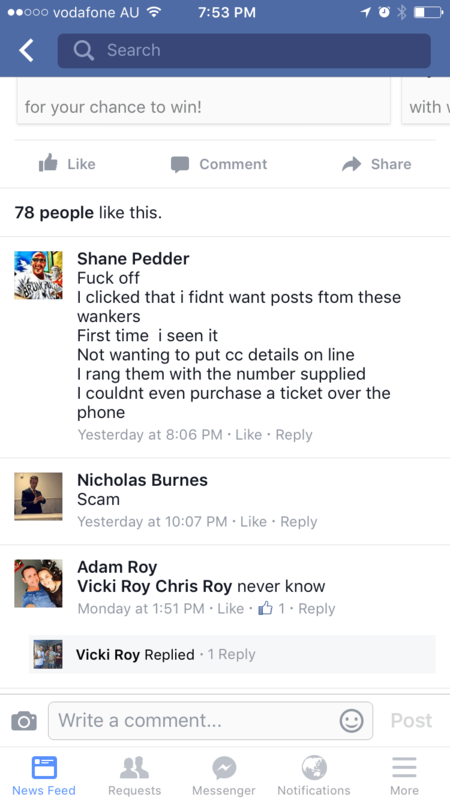 Charity newspaper ads – worth it? 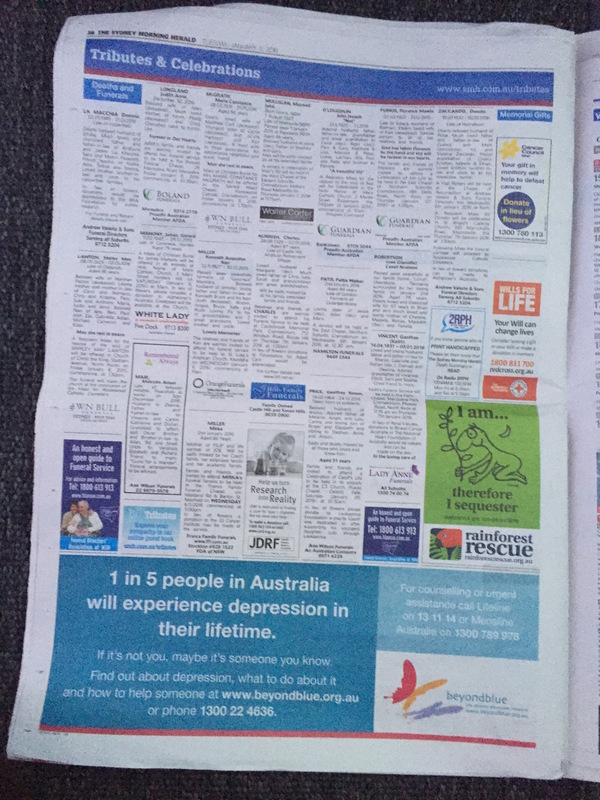 Flipping through the Sydney Morning Herald recently, I ran across a number of charity advertisements on the obituary and classified ad pages. It caused me to wonder how many people actually make a donation because of these newspaper ads? In this particular issue of the Sydney Morning Herald, the various charity ads did not include a source code of any sort. I wondered whether any non-profit organisations actually measure the effectiveness of newspaper advertisement. One could argue I did not buy my first iPod based on any one (or the first) advertisement or billboard I saw. In fact, the purchase likely took repetitive advertisements and/or other encouragement. However, these charity ads are buried in the back of the newspapers. I wonder about their visibility and effectiveness. Does your charitable organisation run advertisements in various local newspapers? If so, how do you know whether they are effective? Donor care or stewardship calls, notes, or Emails are amongst the easiest contacts to complete. So simple, yet we often get bogged down in our day to day activity and we forget how easy it is to simply call someone, write a quick note, or Email. Your financial support changed the lives of the people we serve. Whatever the occasion, or simply to let someone know you are thinking of them, take a moment and reach out to one person today – a donor, volunteer, prospective donor or volunteer, a client, or a colleague. Make it your New Year’s resolution to reach out to one person a week simply to check in with them. Remember to document this contact in your customer relationship management (CRM) system or database just the way you would a meeting or other move. Remember, your contact with donors and volunteers should not just be about funding or a need for a shift to be filled. Take time to let someone know they mean something to your nonprofit or charitable organisation. I received an early Christmas gift. 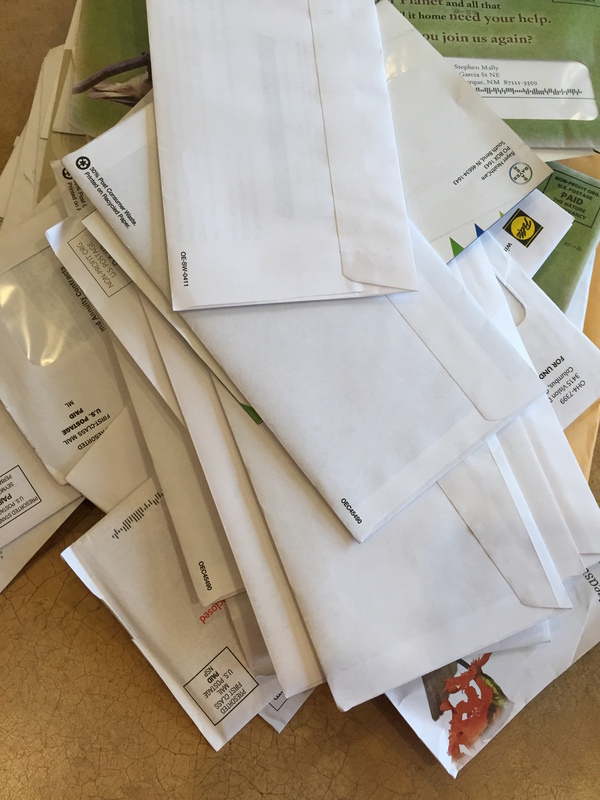 When I arrived in New Mexico for my niece’s 12 December graduation from the University of New Mexico, I was greeted at my parents’ house with a mountain of mail addressed to myself. I have never lived in New Mexico. I have not lived with my parents since 1983. I changed the statement address for my life insurance policy to my parents’ address this last year so I could comply with the requirements of the insurance company. Changing the address with one supplier has allowed (or caused) my name to be placed on what must be dozens (hundreds?) of marketing lists. Charity appeals, including acquisition packages large enough to wallpaper a small bathroom. 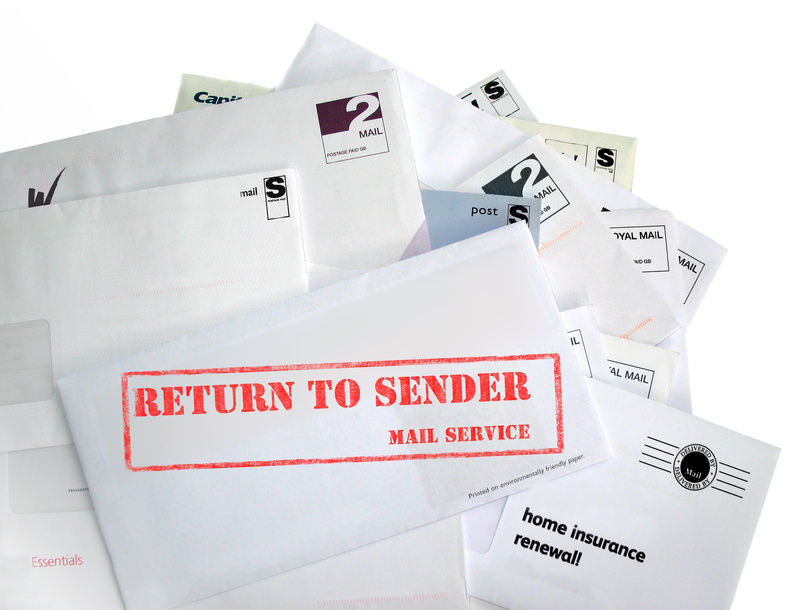 Of the above types of mail, charity mail was the highest in volume. To be clear, I do not fault non profit organisations or companies for renting or exchanging names. In fact, I fully appreciate the fact this is how charities and companies build their database and acquire new donors and customers. I was simply surprised by of the impact of my address change with one company. The fact is when we do not keep up with our mail on a daily basis, we realise the volume caused by actions such as the one I took. CRM search infrastructure lacking in your nonprofit? The customer relationship management (CRM) system or, as some call it “the database system”, is a non profit organisation’s most important asset. FundraisingForce receive at least one phone call a week from non profit organisations seeking assistance with a data base search and many are planning to launch a search now that we are in the new year. 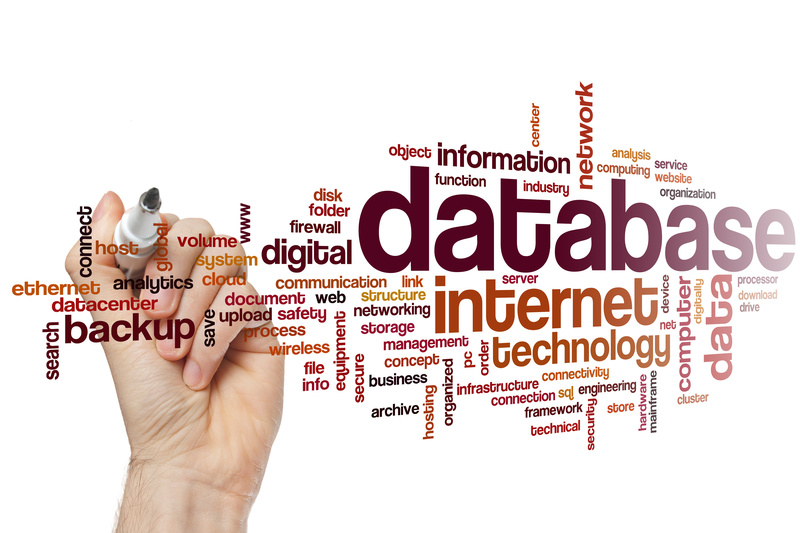 Do not contact any suppliers until you have CRM search infrastructure in order. Financial backing of organisation leadership? Do leadership have realistic expectations of project costs? Organisation resourcing to implement a chosen CRM. Remember, the organisation is required to staff the project in the same manner as the supplier. How will your organisation deal with staff turnover? Staff turnover can become detrimental to a CRM implementation. If your organisation has vacant key positions, perhaps waiting until those positions are filled is the right strategy. Documented, detailed requirements across the entire business. Ensure you focus on the detail rather than “high level” requirements. The more you understand your business requirements, the better suppliers will understand them. Market research, including a list of suppliers and associated products available in our market. Time allocation for a comprehensive CRM search. A CRM search takes time, even if you contract with an external consultant to coordinate the search for your organisation. Be certain you understand the time commitment required of your team. CRM search coordinator. Whether you resource the oversight of the CRM search with an internal resource or a consultant, be sure you identify “who is in charge”. This pint of contact is critical for your organisation and the various CRM suppliers. Empower this person with the responsibility and the authority. Ensuring you have the proper infrastructure in place before you hit the CRM search accelerator is critical. Searches fail because of a lack of organisation readiness, improper resourcing, poor documentation, or unrealistic expectations. Your ability to negotiate with CRM suppliers is dramatically impacted by not having your act together.